One of only three artists this year to be nominated in the same category (Outstanding Direction) in two separate divisions, Ravi Jain’s 2015 work on Toronto’s stages both large (Soulpepper’s Dora-winning Accidental Death of an Anarchist) and medium (We Are Proud to Present… at the Theatre Centre as part of The November Ticket) was groundbreaking, entertaining and important. 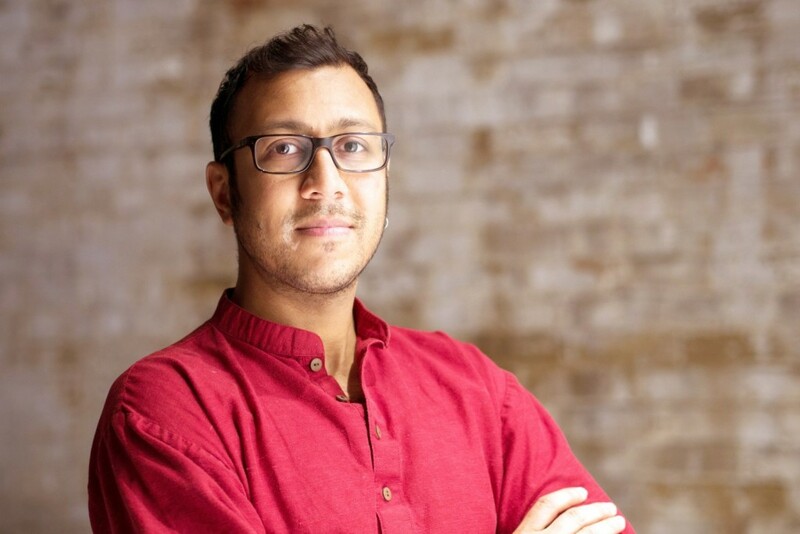 We caught up with Ravi as he heads into a massive year of prestigious projects to look back at what he accomplished last year, the creative funding models that he’s pioneering and the importance of multiculturalism in the theatrical landscape. My first experience with theatre was actually in grade 5, I think… I wrote and directed (if you can imagine) a set of skits that was Santa and Mrs. Clause reminiscing over their relationship. It was for the school Christmas concert. We saw Mr. and Mrs. Clause through the decades, 50s-90s, and there was a soundtrack with each year. Ugh, it makes me cringe thinking about it. But its also hilarious. I raided my brother’s closet for his John Lennon glasses to costume the show. Ridiculous- but funny I just remembered this now… Oh wait… I have a memory of grade 1 or 2, I was doing a skit for the school somethingorother and I was playing a talkshow host who was interviewing someone pretending to be a star, like Bon Jovi or Paula Abdul… anyway, it was obviously improvised and it was going all wrong, so I turned to the audience and said, “my mother always told me to be a lawyer!” and it got a huge laugh. What’s funny is 1. I still basically always use that joke. 2. I always remember that feeling, of discovering a moment, sharing with an audience and being greeted with the roar of a laugh. Who doesn’t? I’m always dreaming up ideas and have a waiting list from my brain to toes. I’m actually trying to carve out time in my life to focus and work on them… so stay tuned. Anne Bogart- she was the first person who ever told me I could be a director; she planted the seed. I created a piece for a class where she was my teacher, the first thing I ever directed (for real) and she was so generous, thoughtful and rigorous in her feedback. She told me I used the stage like Robert Wilson. That gave me a confidence in myself at 21, that has allowed me to not fear fear. Her belief in me is a source for energy that I regularly come back to. Jim Calder – Jim was my first mentor, he is the head of movement at NYU Tisch Graduate Acting School and he trained at Lecoq in the 70s. He always pushed me to be inventive and go beyond the limits of the imagination. He has a subversive spirit that creates the chaos necessary for invention. Jim taught me to be bold and to prioritize the search over the destination. I eventually found my way to Lecoq, 2004-2006. Though he wasn’t there, his impact on me has been tremendous. The school was a place where we learned to be artists and make the invisible visible. Through the body, I connected with a theatre history that is rooted in ancient traditions. The origins of the theatre were a foundation for us to create the theatre of today. The school taught me how to see, make space and value collaboration as the fundamental to the creative process. Daniel Brooks- taught me how to use my ears and listen. I will forever be grateful to him for inspiring a kind of intellectual rigour balances with a sensual sensitivity for things on stage. He’s in my brain helping me to be a better articulator of ideas. Nicolas Billon- the writer who changed my career forever. First guy to say I want you to direct my play. Selfless, generous human. Only in it to be a better artist. Together we pushed each other as artists and some of my most favorite shows I’ve been able to make were his words. That is tough to say. Each has a special place in my heart. Both Accidental Death and We are Proud… as well as all of the plays of Nicolas Billon that I’ve worked on are up there for a tie. Also, I did create a show with my mother called A Brimful of Asha, which has been an incredible joy to tour around the world with… so, I mean, its hard to say. I guess, I only chose projects that I know I will be able to give 100% to. I like projects that challenge me. For me, the theatre has to speak to the moment it is in. The theatre is a place to challenge ideas and the politics of the time. I think humour is an important ingredient to a play… In the darkest of plays, there must always be some light. You are the only director nominated in two different divisions this year- large theatre with Accidental Death of an Anarchist and medium with We Are Proud to Present… both of which are nominated for Outstanding Production. What are some of the major differences between working with a large company like Soulpepper vs. in a smaller space like the Theatre Centre incubator? The main difference would be the audience. Whenever I make a play, I think, who is this for? Who is it speaking to? 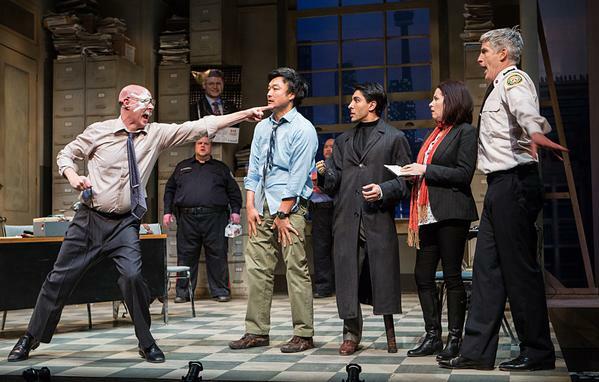 The audiences at Soulpepper for the most part are older and come from a specific socio-economic background. The Theatre Centre is a younger audience and doesn’t necessarily have the same kind of access to money. For both, we are making the highest quality production no matter what our budget is. It really is about what this show will inspire or provoke for the audience, and what they will talk about on the ride home. When you first read Accidental Death of an Anarchist, what were some of the first ideas you had for how to stage it? When I read a play, I don’t immediately think about “staging”. I think more about what is happening and what the situation is. This leads me to think more about the space in which the play happens; the “where”. I think a lot about the where and if and how that changes. Often I think of the world of the play, is it realistic? Heightened? Is it theatrical? Filmic? Then I try to figure out what circumstances to create in the room in order for the actors to be most free to follow their impulses to discover how the play “moves”. I don’t like terms like blocking… it lacks dynamic- who wants to watch a block? What are some of the biggest changes you made in your modern adaptation? I worked a lot with Paula Wing, the adaptor of the piece, as well as the cast, to set the play in modern day Toronto and used many Toronto references to highlight the play’s contemporariness. The Playright Dario Fo’s theatre was a kind of theatre that was immediate, and changed everynight based on the daily newspaper headlines. We had to be current and speak to everything that was going on in North America with regards to race and police violence. A topic which still continues to enrage me everyday. Tell us about working with Outstanding Actor nominee Kawa Ada as your “madman”. Kawa and I worked together for the first time on Nicolas Billon’s Iceland. He is an incredible actor. Very smart. He and I have developed an important trust over the years and that allows us to really push each other to go to places we don’t normally go. I love working with him because together we have an unspoken rule that its our job to bring out the best in each other. It requires a patience and generosity that I feel lucky to have with him. He’s really incredible. The subscriber base at Soulpepper is something of a capitalist crowd. How were the revolutionary arguments, especially in the fourth-wall-breaking section of the play, received over the course of the run? I think the play challenged a lot of the audience, but appealed greatly to another audience base for the company. It was a very different kind of piece for the company and I applaud them for taking that risk. We had people walk out, we had people shout back and argue with Kawa at the end scene… we also had numerous standing ovations and people who saw it more than once. For the most part I think it did push a lot of people out of their comfort zones… And for others, we gave them a space to express their anger and laugh at the absurdity of the world we are in. The theatre needs to be a space for everyone- it can’t rely on servicing the desires of a few. Did you have any big ideas that you threw out during the rehearsal process or something that came in at the last minute? Up until the last minute I was playing with a meta theatrical idea of the actors “setting up” the space. Our set was built to move in pieces and be constructed by the actors as the audience came in. I really loved the idea, I thought it was cool. But in the end, I don’t think it had the payoff that I wanted it to- so we decided to get rid of it. Kudos to my design team who really helped work through what we were doing and made great efforts to make it happen, and generously let it go in service of the show. Tell us about working with your design team to develop the look of the show. The design team were key collaborators throughout the entire process. Throughout the process we ask questions about what we are doing- constantly. I feel blessed to work with such smart and talented people, who make every production go to the next level. Accidental Death of an Anarchist closed fairly quickly but went on to win the Dora Award and is now nominated for multiple MyTheatre Awards. Why do you think there’s such a disconnect between commercially successful and critically successful theatre in this city? What do you think can be done about it? Critics. Ah. Well. I just think sometimes they don’t get it. I was honored that Kelly Nestruck rewrote his review around the time of the Dora’s for Accidental Death… its too bad it was too late though, his original review had a negative impact on the “regular crowds”. The truth is a lot of my shows are successful because of word of mouth, and usually the uniqueness of the experience is what draws people to it. Your other nomination is for the incredible ensemble piece We Are Proud to Present… at the Theatre Centre. Where do you start when facing a piece that complex? That play is all about 6 actors in a rehearsal hall trying to stage a true historical event. They go to great lengths to “be real”, so a lot of our interpretation of the play relied on the “realness” of the production and making the intense content very present for all in the room. 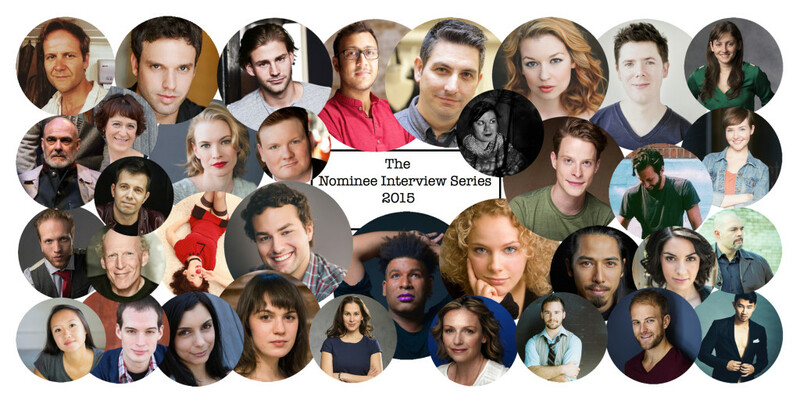 Walk us through your casting process to find your Outstanding Ensemble-nominated group. We were so lucky with the casting. Each actor WAS their part to the T. we spent a lot of time working together, playing and just talking. They were extremely brave and were onboard from day 1 and gelled together. It was amazing to work with them. It was the youngest cast I had worked with in a long time- I couldn’t believe that I was the “old” person in the room! They were brilliant. We Are Proud to Present… is about theatre artists trying to fairly and accurately tell a racially charged story. 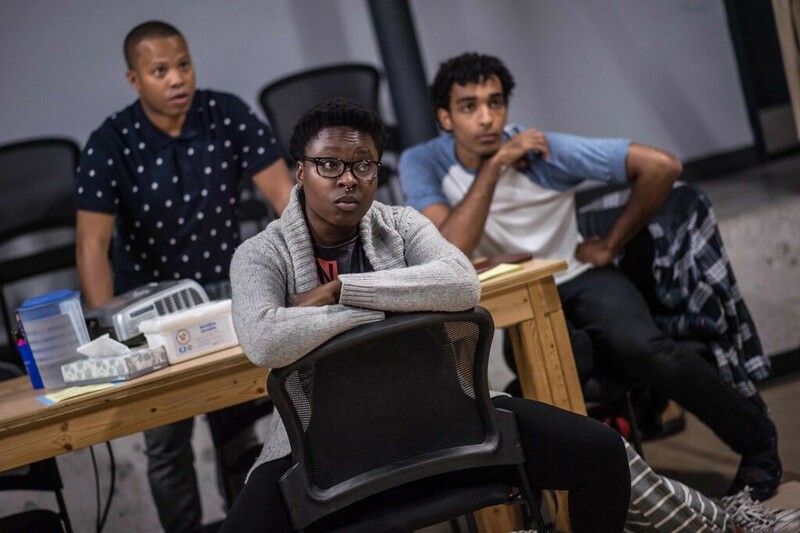 As theatre artists trying to fairly and accurately tell a racially charged story, what were some of the biggest struggles that came up in the rehearsal room? Its incredibly hard to confront the issues of systemic racism and continually talk about it every day. It affects you when you go back out into the world. You see things differently. It isn’t easy to just leave your work at work. So it’s a real uphill climb. Luckily we found humour when we needed it, but for the most part we ensured to create space for each other to vent, breathe or scream if needed. The ending of We Are Proud to Present… leaves the audience sitting in confused, horrified silence with no curtain call. How long did it usually take for people to get up and leave? Sometimes it took as long as 10 minutes. It was a tricky moment to navigate. Some people were upset, some wanted to talk, others just wanted to leave. It was a difficult moment to sit in. It made everything we were talking about very real- there was no getting away from the reality of the issues we were discussing in the play. What were some of the most memorable reactions you heard to that play? People often commented on how they were speechless for a good half hour after the show, then found a deep need to just talk. About everything. That was cool. The new season announcement from Canadian Stage has sparked a lot of controversy around the number of minority artists being featured. Especially coming off of these two incredibly successful and diverse plays, how do you feel about the inclusivity or lack thereof in the Toronto theatre community? What are some of the steps companies can take to start to improve on that front? I don’t like to focus on what people aren’t doing. I’m really proud of what Why Not Theatre is doing, or Acting UpStage, or Theatre Centre or Mammalian Diving Reflex. I think we should celebrate the people doing excellent work, that is inclusive and artistically excellent. With your company Why Not Theatre, you’re dedicated to introducing new producing models like the RISER Project and November Ticket. Why are these innovations so important? They are important because they are challenging the way things are done. They also first and foremost are structures in which independent artists get paid- equity rates! Most importantly, they are structured in a way that fosters collaboration. By getting people to ACTUALLY work together and SHARE resources, we can accomplish a scale that rivals companies with budgets 10 times our size. November Ticket gave Tarragon, Factory and Passe Muraille a run for their money… RISER is an important way for independent companies to not lose their shirts and build a body of work within the city. The Handmaid's Tale: "The Other Side"